Antoine Lavoisier was a French nobleman who was a very prominent figure in biology and chemistry. He gave hydrogen and oxygen their names. He made very valuable contributions to the metric system. This French chemist is also known as the father of modern chemistry. 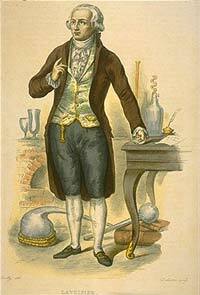 Lavoisier was born into a very affluent family in Paris. When he was five, his mother passed away, and she left him a large fortune. In the mid 1700’s he attended the Collège Mazarin and studied astronomy, botany, chemistry and mathematics. He obtained a law license in 1764 before embracing a career in science. When he was 25, he became a member France’s elite scientific organization, the French Academy of Sciences. His first science publication occurred in 1764. He worked on France’s first geological map in 1769. He discovered oxygen’s role in corroding metal, along with its role in plant and animal respiration. Lavoisier conducted experiments with Pierre-Simon Laplace that demonstrated respiration was fundamentally a very slow type of combustion of inhaled oxygen. His description of combustion showed that the phlogiston theory was incorrect, because it postulated that organic materials released phlogiston components. Lavoisier’s primary contributions to science were due to his conscious efforts to make all experiments fit into the model of a single concept or theory. He set up the steady utilization of the chemical balance, which used oxygen to rule out the phlogiston theory. He also helped to develop a whole new chemical nomenclature system that stated oxygen was an important component of all acids, later this was proved to be erroneous. He conducted many research studies in physical chemistry and thermodynamics. He used a calorimeter to calculate the amount of heat that was produced for each carbon dioxide unit that was generated. He eventually discovered the identical ratio for animals, suggesting that animals also generated energy by a certain kind of combustion reaction. Lavoisier did not discover any new substances. He was basically a theorist, and was successful at taking over experimental work that other scientists were working on or he collaborated with them. He finished the works of Black, Cavendish, and Priestley, offering accurate explanations of their various experiments. He helped to create the metric system when he worked for the government. This system secured the uniformity of all weights and measures in France. His contributions were very important in advancing chemistry to the same levels that mathematics and physics had reached during the eighteenth century. In 1999, his work was acknowledged by the American Chemical Society, and also the Société Chimique in France. He was a very powerful figure in the Ferme Générale, which was a privately-held business that collected taxes for the royal government. This organization was unpopular with the citizens who thought it was corrupt because they profited greatly with their position. In 1794, he was labeled a traitor during the Reign of Terror. Lavoisier was tried, found guilty, and guillotined in May, 1794. Lavoisier was exonerated, eighteen months later by the government.